Knowledge of important environmental issues is vital to the preservation and improvement of the beautiful environment that we currently enjoy at Smith Mountain Lake and the surrounding area. These issues include water quality, invasive plant and animal species, species extinction, water runoff/erosion control and effects of climate change. It will help us be better stewards of our environment by providing education for a general knowledge and appreciation of nature to our citizens. SMLA provides environmental education to the Smith Mountain Lake community to encourage protection and improvement of the environment in and around the Roanoke Valley Watershed. Our all-volunteer force works with both adults and school age students to educated them on the environmental issues associated with protecting the watershed and the lake. The SMLA Environmental Education Committee is comprised of members of SMLA and local educators who are concerned about the environment of our lake community. Many are members of the Virginia Master Naturalists and Virginia Master Gardeners. SMLA provides environmental education to both children and adults in the lake area, and we host a variety of educational nature talks to the public. We support Earth Day activities as well as environmental activities at the Smith Mountain Lake State Park and Booker T. Washington National Monument. We visit local schools and other local organizations. Our youth are our future. It is our responsibility to insure that they understand and appreciate the wonderful world of nature that we enjoy at beautiful Smith Mountain Lake and the surrounding area. By teaching our youth about nature and how it interacts with us on a daily basis, we will preserve this blessing for future generations. It is our legacy. Our members volunteer at a variety of venues in this quest, including the Claytor Nature Center in Bedford to teach children about the importance of water quality and its affect on the environment in the Roanoke Valley Watershed. Buffer landscaping consists of vegetation planted near the lakeshore to trap sediments and to filter nutrients and pollutants. It also serves to prevent erosion and stabilize sloped areas of the shoreline. 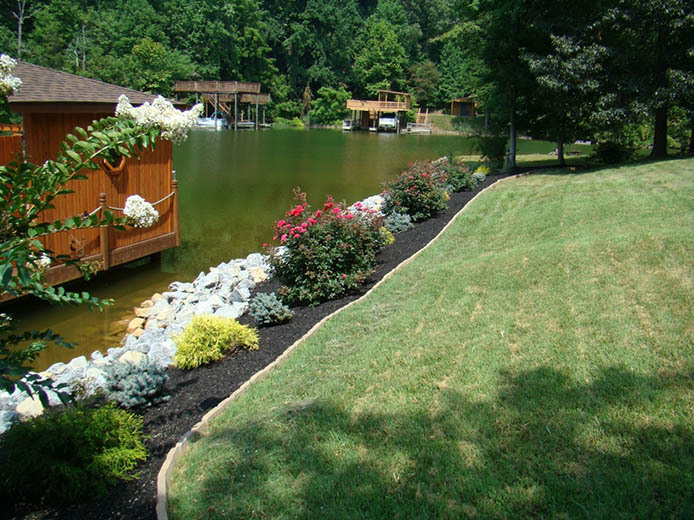 Buffer Landscaping promotes the concept that landowners can have a beautiful lakefront while being lake friendly and environmentally sound. Member Master Gardeners have developed a protocol for the establishment of gardens of native vegetation to filter contaminants and fertilizers flowing to the lake. Please visit the Buffer Landscaping Web Page for detailed information. 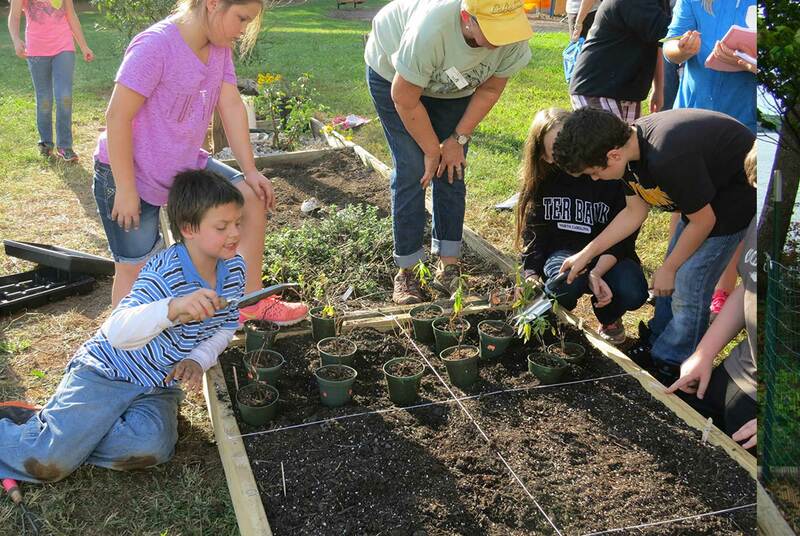 The Buffer Landscaping Committee consists of a team of about 20 volunteers many of which are Virginia Master Naturalists and Virginia Master Gardeners. Our mission is to preserve the lake shoreline and water quality while providing wildlife habitat and protecting your property investment and enhancing the beauty of the lake. Committee members are available to make recommendations to homeowners on how to slow and filter water flowing into the lake using native plants. Committee members help create demonstration gardens and provide on site advice to lake residents as well as recognize efforts of our residents who utilize effective buffer landscape techniques. We are also available to speak to groups interested in this program. The talk on buffer landscaping is both informative and entertaining. SMLA will send our Buffer Landscape Advisory Service Team (BLAST) members to your home to advise and make recommendations on how to improve buffering characteristics of lakefront or near lakefront properties. You can request a BLAST visit by calling the SMLA office 540-719-0690 or email theoffice@smlassociation.org. The Virginia Department of Health (VDH) seeks assistance from SMLA to educate Lake Residents on property purchase requirements as well as proper maintenance of residential septic systems that could seriously impact the health of the Lake. The Virginia Department of Health does not require activities in conjunction with the buying or selling of property with septic systems. However, during real estate transactions involving properties with septic systems, questions often arise from buyers, sellers, and lenders. The first step for those involved is to understand how septic systems work and what the property owner’s responsibilities are regarding septic systems. You can learn more about how systems work HERE. You can learn more about owner responsibilities HERE. 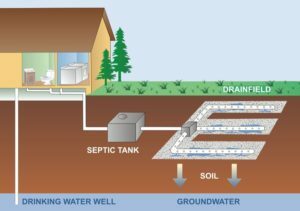 Once you understand how septic systems work in general, you will want to know exactly what type of septic system serves the property you’re interested in. Conventional Sewage Systems – a treatment works system consisting of one or more septic tanks with gravity, pumped, or siphoned conveyance to a gravity sub surface drainfield”. A typical COSS in Virginia consist of a sewer line, a septic tank, a conveyance line, a distribution box, header lines, and multiple absorption trenches. In most cases these components are not visible from the surface. Alternative Sewage System – a treatment works system that is not a conventional onsite sewage system. A typical alternative system in Virginia consist of a sewer line, septic tank/trash tank, treatment unit, pump chamber, conveyance line, distribution system, and absorption field (trenches, pad, drip tubing, etc.). However, the exact set of components that make up your system will be site specific. These systems typically require annual maintenance from a licensed service provider. Alternative Discharge System – a treatment system that typically discharges directly to a dry ditch or stream. Operation and maintenance of direct discharge systems are covered under separate regulations. Requires a permit from DEQ in addition to the VDH permit. Here are some things that you may want to consider before purchasing a property served by onsite sewage system. A list of documents that may provide helpful information about your specific system can be found at the Office of Environmental Health’s website. Each type of septic system has specific maintenance instructions and requirements. The following link provides maintenance guidance for alternative onsite sewage systems and alternative discharging sewage systems (HERE). Each county in Virginia may have additional maintenance or pump out requirements. Franklin County requires that property owners with a septic tank and/or drain field that is located within five hundred (500) feet of the seven hundred ninety-five foot contour of the shores of Smith Mountain Lake be pumped out at least once every five (5) years unless one or more of the following are met: (a) an inspection by a qualified handler finds the tank to contain less than one-third of its capacity; or (b) qualified documentation verifies the property was unused for thirty six consecutive months within a given five-year period. Contact Franklin County for the specifics of these exceptions. Reference Chapter 17, Section 17-8 of the Franklin County Code. Bedford County requires maintenance/inspection for short-term rental properties. More information about the Bedford County Short Term Rental Ordinance (Sec. 30-100-18) requirements the can be found HERE.